It’s time for another Recipe ReDux challenge, here is this month’s theme: Celebrate a ReDuxer! 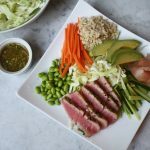 This Asian Salad with Wasabi Crusted Ahi Tuna is my take on The Grateful Grazer’s Deconstructed Sushi Bowl. Her recipe is an oh-so flavorful meatless (vegan to be specific) entrée that truly conveys the essence of sushi in a bowl. Although the execution is quite different, this recipe shares the same foundation that Stephanie created in her Sushi Bowl. 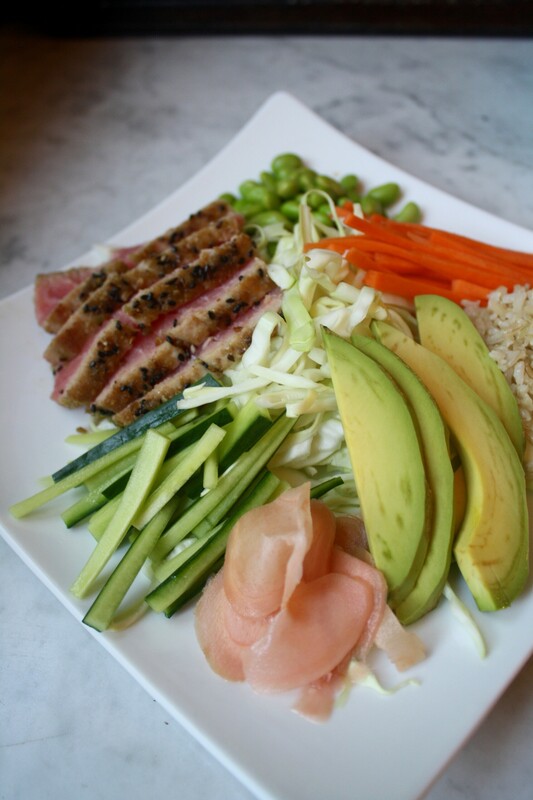 The most obvious difference between our two sushi bowl recipes is the addition of ahi tuna to my Asian salad. 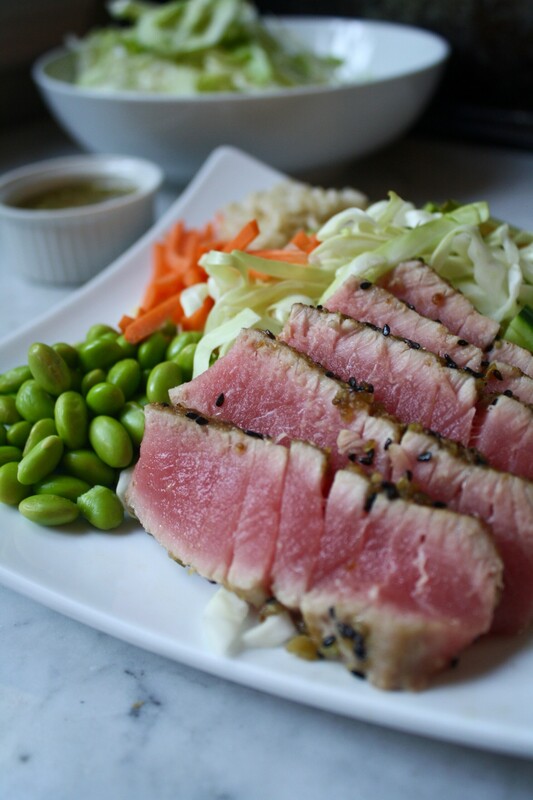 The ahi tuna is encrusted with wasabi peas and sesame seeds, then seared in a hot pan for a crisp, flavorful exterior and rare interior. Green cabbage acts as the base of this salad, lending a refreshing crunch that pairs well with fresh vegetables, tender edamame, chewy brown rice, and creamy avocado. The dressing takes a little bit of a different route as well. Ponzu, a citrus enhanced soy sauce, is the base of this dressing. If you don’t have ponzu you can easily use soy sauce, preferably low-sodium, and a splash of lemon or lime juice. I then add sesame oil, rice vinegar, fresh garlic, ginger, and wasabi to create an out-of-this-world Asian dressing. It’s so good. So the next time you get a hankering for sushi, give this salad a try. It’s sure to satisfy your craving! Taking inspiration from sushi, this Asian Salad has all the components of your favorite roll, all tossed together in a sesame ginger vinaigrette. 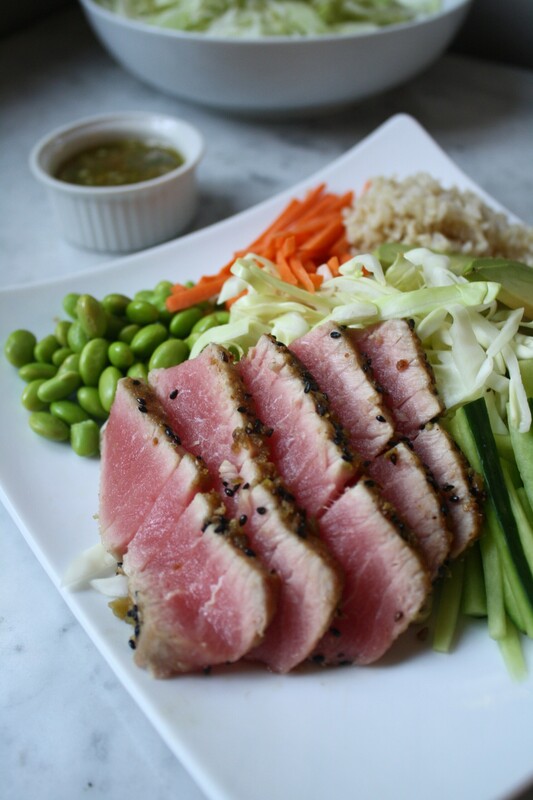 Healthy, flavorful, and satisfying, this ahi tuna salad is a winner! Place wasabi peas in a mini food processor and process until they resemble coarse breadcrumbs. 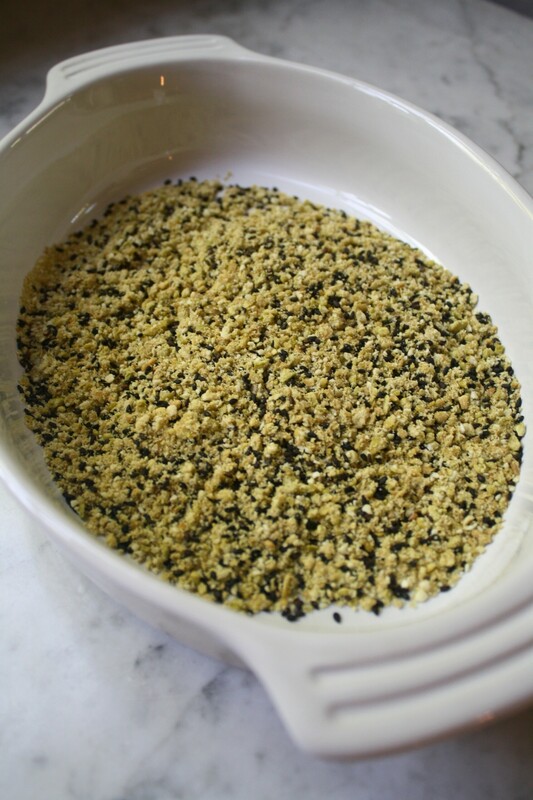 Transfer to a shallow bowl, add sesame seeds and whisk to combine; season with salt and pepper. Pat tuna steaks dry, then coat with nonstick cooking spray. Press tuna steaks into wasabi pea mixture, coating all sides. Heat canola oil in a large nonstick skillet over medium-high heat until shimmering. Add tuna steaks to pan and cook 2 minutes per side, for rare. Transfer to a plate and let rest 5 minutes; slice thinly. Whisk together ponzu, olive oil, vinegar, sesame oil, honey, scallion, garlic, ginger, and wasabi; season with black pepper. 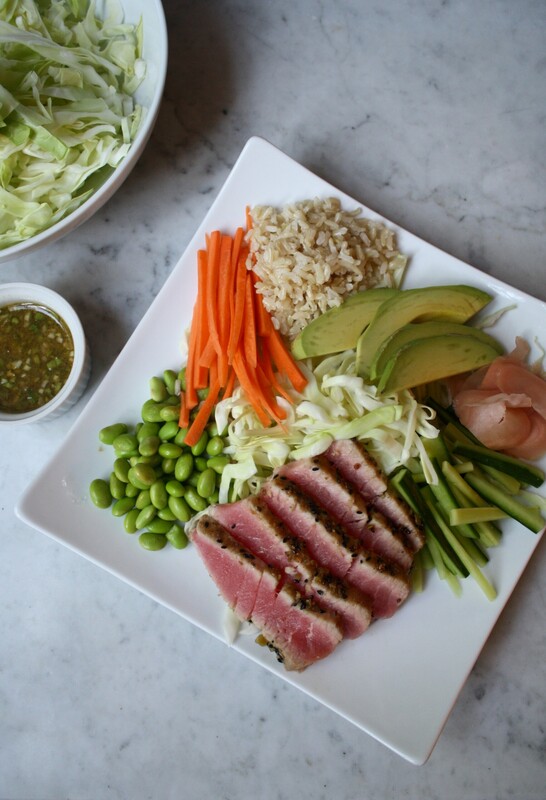 Arrange cabbage, carrots, edamame, cucumber, avocado, brown rice, pickled ginger, and tuna on serving plates, drizzled with vinaigrette.